The exact cause of carpal tunnel syndrome is not known. 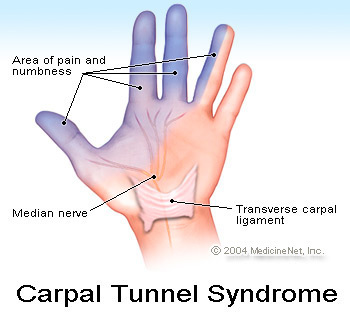 It may be that pressure, irritation, swelling, or blood flow problems in the carpal tunnel damage the median nerve. Irritation and pressure may come from using your hand and wrist in the same motion over and over. For example, carpal tunnel syndrome is a common problem for cashiers, carpenters, assembly-line workers, and people who work on a keyboard or with a computer mouse. Or a broken bone or other injury may damage or put pressure on the nerve. You may have a higher risk of carpal tunnel syndrome if someone in your family has this problem, or if you are pregnant or have a disease like arthritis, diabetes, or a thyroid problem. Have you tried splinting your hand? Keeping your wrists straight can help relieve the pressure on your median nerve. Symptoms are more common at night, so wearing a splint in the evening may help relieve your symptoms before they start. If you have issues with repetitive tasks at work, you can also wear wrist splints during the day. You may do all of these exercises right away. 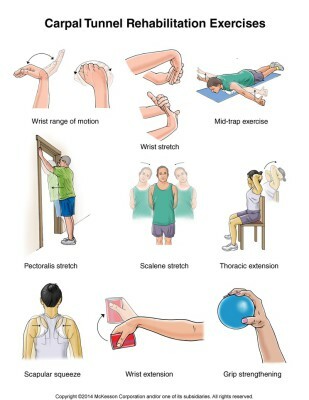 Flexion: Gently bend your wrist forward. Hold for 5 seconds. Do 2 sets of 15. Extension: Gently bend your wrist backward. Hold this position 5 seconds. Do 2 sets of 15. Side to side: Gently move your wrist from side to side (a handshake motion). Hold for 5 seconds in each direction. Do 2 sets of 15. Wrist stretch: Press the back of the hand on your injured side with your other hand to help bend your wrist. Hold for 15 to 30 seconds. Next, stretch the hand back by pressing the fingers in a backward direction. Hold for 15 to 30 seconds. Keep the arm on your injured side straight during this exercise. Do 3 sets. Wrist extension: Hold a soup can or hammer handle in your hand with your palm facing down. Slowly bend your wrist up. Slowly lower the weight down into the starting position. Do 2 sets of 15. Gradually increase the weight of the object you are holding. Developed by RelayHealth. Published by RelayHealth. Copyright ©2014 McKesson Corporation and/or one of its subsidiaries. All rights reserved.